Guard Ezra Hoskins was killed as he confronted four inmates who were attempting to escape from Wethersfield State Prison. On the night of April 30, an inmate managed to bore through the lock of his cell with a dinner utensil and to free another inmate who had fashioned a skeleton key for the prison. The inmates unlocked the cell doors of two other prisoners and followed Guard Hoskins on his rounds. They then concocted a ruse to murder him so that they could continue with their escape. At midnight, one of the inmates circled the walkway between cells and appeared suddenly in front of Guard Hoskins, who could not hear his movements due to deafness. As Guard Hoskins approached him and asked him what he was doing out of his cell, another inmate attacked Guard Hoskins from behind, hitting him on the head with an iron bar. The inmates then beat Guard Hoskins until they ascertained that he was dead and attempted to flee the prison through a door near the women's cell block. However, a female inmate noticed them out of their cells and alerted the matron, who quickly sounded an alarm. All four inmates were recaptured before they could leave the prison. The two inmates who were directly responsible for Guard Hoskins murder were sentenced to death and hanged on September 6, 1833. Guard Hoskins was 66 years old at the time of his death. 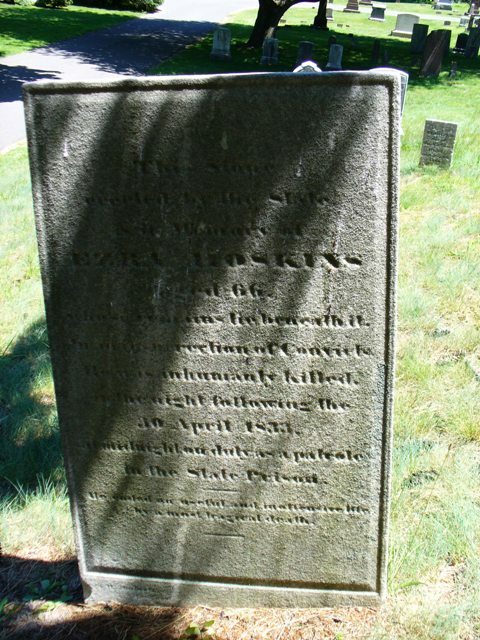 He was preceded in death by his wife and is buried in Wethersfield Village Cemetery, Weathersfield, Hartford County, Connecticut. Thank you for you're service sir. Sad that such a incident had to happen at your advanced age. Rest in peace sir.